Two men have been arrested on suspicion of theft and burglary after eight bikes and a compound bow were taken from a garage in Northfields. 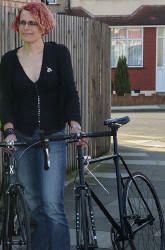 Three weeks ago Ealing's bike lady Charlotte Barnes asked for help to trace her specialist cycles and was overwhelmed by the response. 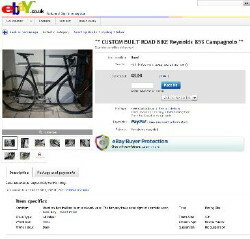 Details of the stolen items were sent out via social media outlets and she heard back that a number of her bikes had been spotted on eBay. The Cycle Task Force, who are funded by Transport for London, made enquiries with the website and as a result carried out a search warrant on 2 March at a house in Sutton. Officers found 14 bikes, including the eight bikes stolen from the burglary. Enquiries are underway to establish if the remaining bikes are also stolen. Two men have been arrested in connection with the incident. A 42 year old has been arrested on suspicion of theft of pedal cycles and a 28 year old has been arrested on suspicion of burglary. They have been bailed to return to police in May. Cycle Task Force sergeant Titus Halliwell, said: "The Cycle Task Force is dedicated to tackling cycle theft across London and we are so pleased to have been able to recover these bikes and reunite them with their rightful owner." "We advise any cyclist to follow 'the three R's' - record the details of their bike, register them onto online property databases and report any theft to the police. These are simple steps that all cyclists should take so that if their bike is stolen they stand a good chance of being reunited with it." "If you are a victim of bike theft and you suspect your bike is being sold, do not arrange to meet the seller, contact the police, quoting your crime reference number." Charlotte has now been reunited with her bikes and is absolutely delighted.